“Does Europe even know we’re here?” asks Aras Wali, as he rubs his eyes and shuffles uncomfortably in his tent, seeking out the shade. Aras is 26, but nine months of travel through deserts, roadblocks and war-ravaged towns have left him sun-lashed, exhausted and looking closer to 35. He’s a former private in the Syrian Army who fled his country after finding out he had to go to war with it, making the 370-mile trip across Syria while hiding from pro-Assad forces in the trunk of a car. After reaching the border with Israel, he moved overland through North Africa – to Morocco and then the Spanish-administered town of Ceuta, which he entered illegally, hoping to begin life again in mainland Europe. But it didn’t happen like that. Aras is one of many Syrian refugees now stuck in Ceuta, a small town separated from mainland Spain by the intersection of the Atlantic Ocean and the Mediterranean Sea. Detained by Spanish authorities on a routine passport check by Ceuta’s police, he and his fellow emigrants are unable to move toward Europe and unable to return home – they are trapped in limbo, waiting for Spanish authorities to let them leave. Aras Wali's card for "international" protection as a political refuge, valid for Ceuta only. All photos by the author. For individuals caught crossing into Ceuta illegally, the Spanish government follows one single protocol regardless of circumstance. Since they maintain no deportation treaties with neighboring Morocco, they are not legally allowed to send them back across the border. Instead, they are taken to stay in Ceuta’s Centro de Estancia Temporal de Inmigrantes (CETI), an open-door, yet vastly overcrowded internment center where they are given food and a bed to sleep in, and allowed to stay until Spanish authorities decide what to do with them. “If this were France, Germany, England, I’d have my documents already,” Wali tells me. “I have friends who live in Europe now and it was easy. I’ve been in Ceuta four months – still nothing. I cannot go back to Syria. I was in the military and I am a Kurd from Aleppo. If the army doesn’t kill me, the radicals will.” Wali is one of the few who have applied for asylum in Spain as a political refugee, and has been issued a red card, signifying “international” protection as a refugee, which is valid in Ceuta only, not the mainland, and must be renewed every six months. The actual process for granting asylum can take up to two years. Deeba El Ali, 84, the oldest member of the group. Wali once tried to reach mainland Spain by sneaking onto a ferry that runs between Ceuta and the Spanish town of Algeciras, but the police cuffed him, locked him up for two days, took his fingerprints and then released him back into Ceuta. Ceuta is only about 25 miles away from the rest of Spain, and the journey takes an hour by ferry. But its land border with Morocco is no joke. It’s marked by a 6.5-yard fence topped with razorwire, which runs just over five miles along the low scrublands surrounding Ceuta. The fence is patrolled by heavily armed Spanish security forces, and punctuated every half-mile or so by watchtowers with infrared cameras used to detect individuals trying to jump it under darkness. Now, an 84-strong population of Syrian refugees like Aras who’ve made the crushing trip overland and managed to reach Ceuta have begun to camp in one of the city’s main squares, Plaza de los Reyes. Their makeshift camp, strewn with dome-tents and hanging laundry, sits in full view of the governor’s offices, and was erected about two months ago in protest over their detention and in an effort to draw attention to their wish of gaining safe passage to Europe. But Ceuta’s authorities continue to ignore them. Before the war, Hussein was a student of economics at Aleppo University. He’s also a journalist trained by Dutch media company Free Press Unlimited who covered the early days of the Syrian revolution. When Syria began barreling into civil war, however, the company ceased funding the journalists they’d trained, and pulled out of Syria completely. “I had to get out,” Hussein tells me. Through a network of friends and an uncle living in Istanbul, Hussein made contact with the Turkish mafia and began to enquire about smuggling himself into Europe on a boat from Turkey. Refugees charge phones and laptops in cafes and snack kiosks to communicate with family in Syria. “It was too much – the Turkish mafia wanted $100,000. I found that Morocco joined Spain through Ceuta. I crossed the Algerian desert on foot and came to Morocco. 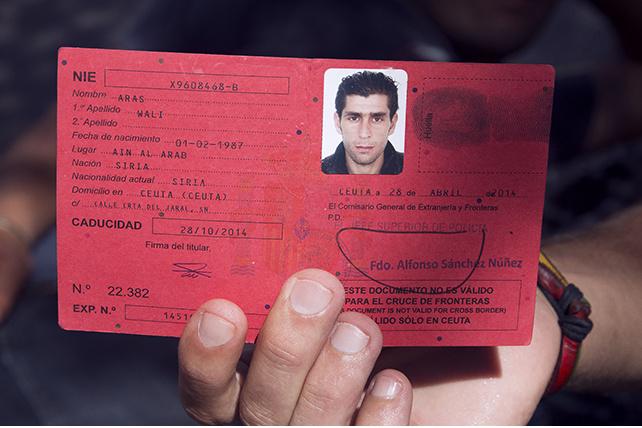 I tried to cross into Ceuta twice – first on a fake Moroccan passport, then a Spanish one. I didn’t even look at the name on it, but the second time I got through. And now, this,” he says, turning his hands upward. Hussein was caught just a few days after crossing the border, when Ceuta police conducted a routine inspection of his papers, and discovered that his passport was a fake. As we continue talking, I ask him what it feels like to be stuck in a country without any valid documents, unable to move forward. Islamist Rebels Are Allegedly Crucifying People in Syria. Read more here. Hussein’s story mirrors many of the other protesters’ camped in Plaza de los Reyes. Most have travelled overland routes from Syria through Israel, Egypt, Libya, Algeria, Turkey and into Morocco. Those living in Northern Syria, particularly around Aleppo, crossed into nearby Turkey and then took boats to Egypt to pick up the above trail across North Africa. Many hid in trucks or walked through the night with what they could carry, the trip taking anywhere from six months to two years. Hussein estimates that the financial cost for all the Syrians who’ve made it to Ceuta over the last two years comes to more than $200,000 (£117,000) in food, transportation, border bribes and fake passports. The religious practices of the group's muslims must still be strictly observed. At the moment it is also Ramadan, so many in the camp are fasting. Alongside Spanish-administered Melilla, which sits 240 miles to the East, Ceuta’s main focus is often the giant barbed-wire fence separating it from Morocco, which is regularly stormed by Sub-Saharan migrants trying to reach Europe, frequently resulting in deaths. But Ceuta’s political refugees often go unseen. Aras Ramos, 26, is another Aleppo economics student and a friend of Hussein’s. Like Wali, he is one of the few who has been issued a red card. I ask him how long he’s been in Ceuta. In Syria, the Enemy of America's Enemy Is Still a Lousy Friend. Read more here. So the Syrians left the CETI and gathered in Plaza de los Reyes, protesting the case for their right to pass to the Spanish peninsula. The oldest of the group is Deeba El Ali, an 84-year-old who made much of the journey by foot. The youngest was born in a hospital up the road from the Plaza just two weeks ago. Hussein lifts her out of the tent and places her in my arms, her hair wrapped in a blue ribbon, her eyes barely able to open. The youngest member of the group was born three weeks ago. “She’s very weak,” Hussein sighs. “This is a very bad situation.” He tells me how several of the young children have trouble standing unaccompanied due to lack of calcium and malnutrition. I ask about any aid the city may have offered and he shrugs. The Spanish Red Cross visited them with bottled water on a particularly hot day around a month back, but since then, nothing. Volunteers from a local mosque bring them food every night, but the city appears unwilling to help. “Remove the issue rather than resolving it?” I ask. “There’s been a dialogue to try and take into consideration the people of Ceuta’s right to use the public space and the needs of the refugees. They can sleep in CETI every day and protest here. But protesting cannot give you more rights than not protesting.” I ask about the process of appealing, and what legal help the refugees might have, considering most can’t even speak Spanish. Up in the government offices, which overlook the camp, officials are even less willing to budge. Syria: Wolves of the Valley. Watch here. Back in the camp, the sun’s been burning all day and people are exhausted. They lie in the shade or wash their hair in plastic bowls, children chase pigeons. Some argue or sit smoking. I talk to one of the group’s older members – an ex-factory worker from the Kurdish south, with handsome stony features. “Here, like Syria, Kurds like me don’t have rights. So we ask about democracy. No place is more democratic than Europe, we think. I came here to get my rights, but this is not democracy,” he says, stroking the head of the young child next to him. Opposite 24-year-old Khalid al Batar, a baker from Homs whose business now lies in rubble. The heat, boredom and my persistent questioning are causing him to become increasingly agitated.